Dignan Porch, started life as a one-man bedroom project for band leader Joseph Walsh, has now blossomed in to a ramshackle group of perpetually laid-back sounding humans creating music that straddles the lines between psychedelia, folk, indie pop and grunge. When the Porch kick out the jams they give the impression that they're careering along with only a couple of wheels still on the road, just about in control, but always on the verge of tipping over. 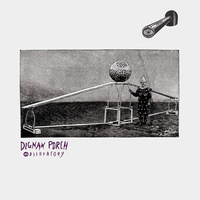 There is a sadness that lurks beneath many of these rough-around-the-edges pop songs, a blurry-eyed realisation of the boredom of everyday life that seems to creep in to the very fabric of Dignan Porch's sound. The ash tray is full, the can is empty. The majority of Observatory was written and recorded at home during 2013 when Joe was living in a flat above a used-carpet shop in South London. It was cold and noisy but the rent was low, there were no neighbours to disturb and his room was huge. The perfect setting. The best of times / the worst of times. The band spent evenings and weekends getting their parts down and piecing the songs together. This DIY approach to recording works perfectly for Dignan Porch though, mid-fi fits them well. This is Dignan Porch's third album (having released a couple on New York's revered Captured Tracks label), and their first for Brighton's Faux Discx. Recorded at home by Sam Walsh and Joseph Walsh, except tracks 6, 7 and 11 recorded at Sound Savers by Henry Withers. Observatory artwork by Ed Harris. Layout and additional artwork by Hayley Akins. Released by Faux Discx on 180g black vinyl with printed insert. Edition of 500. Comes with digital download code.